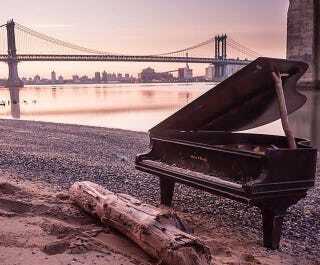 A baby grand piano has mysteriously appeared under the Brooklyn Bridge in New York, right on the Manhattan side of the East River. Everyone in the city is speculating about its origin: Some people think it may be a viral marketing action, others think it may be an art project, but nobody really knows why or how it got there. See update at the end of the post. The beautiful photo on top was taken by Instagram user Scenes from NYC. Here's a photo by Meredith Marciano. You can see the Manhattan Bridge on the background. Though it's still in one piece, it looks like it's been through a rough voyage. Folks can't figure out how it got there, but that's not stopping them from photographing, videoing, and Instagramming it, turning it into NYC's latest bizarre, yet strangely beautiful piece of urban scenery. What's your theory? Tell us below.